The Parliamentary Consultative Committee to the Ministry of Steel and Mines has just met. Its chairperson, the Union Minister of Steel and Mines, Narendra Singh Tomar, has following the meeting made an announcement which, if even partly pursued, will alter hugely India’s energy use, our energy mix and our emissions of CO2. Its ecological impact can barely be guessed at. Tomar said that until 2014 India was the fourth largest producer of iron and steel in the world (after China, Japan and USA). The first five months of 2015, according to industry data, indicate that India will end the year one position higher. This possibility is seen as a triumphant landmark by the present government, for USA will then be relegated to fourth place. As the table alongside shows, India produced 81.3 million tons of steel in 2013 and 86.5 million tons in 2014 (data from the World Steel Association). The achievement that the minister is so proud about is the data for January to May 2015, during which time India produced 37.6 mt compared with the USA which produced 33.1 mt. On this basis, Tomar and the ministry and the country’s iron and steel industry see a bright future. So bright indeed that Tomar (having duly consulted the mandarins who are in the know of such things in the ministry) announced that as India’s per capita steel consumption is “quite low, 60 kilograms as against the world average of 216 kilograms, this low consumption no doubt indicates huge growth potential for Indian steel industry”. It hasn’t occurred to any inside the ministry or outside it apparently to wonder whether we would get by quite nicely with 60 kg per person per year or even 50 kg, now that so much has already been built using iron and steel. But no, Tomar has instead grandly announced to the members of the Parliamentary Consultative Committee that “India has fixed a target of 300 million tonnes production capacity by 2025 and steel ministry is working out action plan and strategies to achieve this target”! Where did this absurd ‘target’ come from? Does the Union Minister of Steel and Mines simply make numbers up as he wanders about gawking at blast furnaces and iron ore mines or are there advisers in this ministry, in the Ministry of Power (which includes coal and renewable energy), in the Ministry of Environment, in the Ministry of Rural Development and in particular in that ministry’s Department of Land Resources, who has given him these numbers? Or has this monstrous and foolish number come from the world’s iron and steel industry and in particular its Indian private sector heavyweights? That phase concerns India, the pause is the building of new steel-making capacity in India (and the staking out of new areas, many under dense old forest, to dig for iron ore and for coal), we are the market other than China (whose steel plants are working at 70% of capacity, if that, and whose consumption growth has stopped), and it is India, in this metallic calculation, that will drive new demand. That is the reason for Tomar’s announcement of per capita kilo-consumption of steel and the 300 million ton figure. It is scandalous that a minister in charge of a major ministry makes such an announcement without a moment’s thought given to what it means in terms of energy use and what it means in terms of raw material. It takes a great deal of energy to make a ton of steel. Industry engineers call it energy intensity and, including the wide range of methods used to make steel and the wide variety of raw materials used, this energy intensity varies from about 15 gigajoules (GJ) per ton to about 23 GJ per ton. Put another way, it takes as much energy as 22 average urban households in India use in a month (at about 250 units, or kilowatt hours, per month each) to make a ton of steel. This is the equivalence that ought to have been discussed by the Parliamentary Consultative Committee so that choices can be made that lead us to decisions that do not bury us under kilograms of steel while we suffocate from pollution and have no trees left to provide shade. The equivalence begins with the 86.5 million tons of steel India produced in 2014. This is 237,000 tons per day. India also generated some 1.2 million gigawatt hours of electricity in 2014-15. The two measures are not operands in the same equation because steelmaking also uses coking coal directly. What we do know is that the residential and industrial sectors consume about 40% and 30% respectively of energy generated, that the making of iron and steel is extremely energy-intensive (it is estimated to account for about 6.5% of India’s total emissions), and that this sector alone accounts for a quarter of India’s total industrial energy consumption. And this is at 86.5 million tons, whether we stand at third or fourth place on the world steelmaking victory podium. To make these many tons (for our regulation 60 kilos per year ration) it takes a gigantic quantity of raw material. A ton of steel produced in a basic oxygen furnace (which is how 42% of our steel is made) requires 0.96 ton of liquid hot metal (this in turn comes from 1.6 ton of iron ore and 0.6 ton of coking coal) and 0.2 ton of steel scrap. A ton of steel produced in an electric-arc furnace (58% of steel is made this way in India) requires around 0.85 tons of steel scrap and supplementary material amounting to about 0.3 tons (the coal having been burnt in the thermal power plant elsewhere). What justification can Minister Tomar and his associates provide for this mad project to enclose all Indians in choking suits of armour? it comes from the world’s foremost ironmongers, speaking through their association: “The impact of urbanisation will have a key role to play in the future. It is estimated that a little more than one billion people will move to towns and cities between now and 2030. This major flow will create substantial new demand for steel to be used in infrastructure developments such as water, energy and mass transit systems as well as major construction and housing programmes.” And there we have it – the urbanisation obsession of India translated into ever heavier per capita allotments of metal, and to hell with the trees and the hills. 1) Actual action to reduce carbon emissions and greenhouse gases has been pushed back by years, probably five and maybe even 10. A new treaty will take several years to negotiate and a few more to get it ratified by enough countries so that it makes a difference. 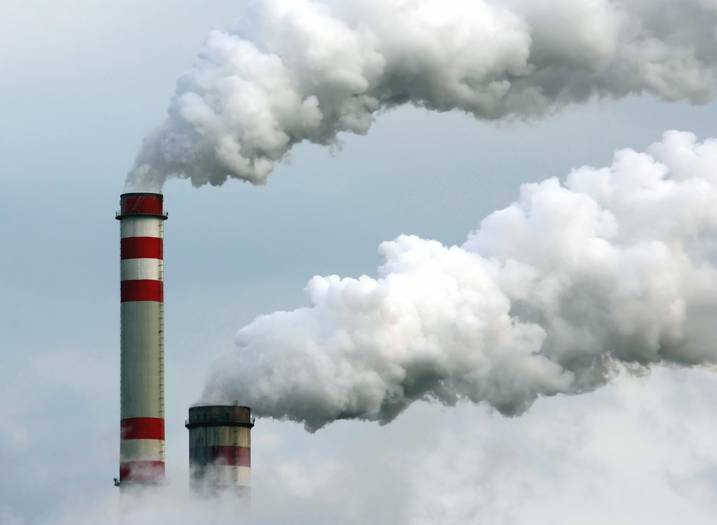 Even then, major polluters like the USA (especially the USA but also China, India, Russia, Brazil, Indonesia and South Africa) may not ratify it. We don’t know – since it wasn’t spelt out in Durban – that any new agreement won’t be a weak and useless ‘pledge and review’ system. 2) Developed countries want to end the Kyoto Protocol. But they also want to retain and expand parts of the Kyoto Protocol they like. This includes the CDM (Clean Development Mechanism). The European Union (EU) is most keen on this. By doing this they want to continue to transfer their responsibilities to developing countries. Since Durban ended with no legally binding emission reductions (under the expiring Kyoto Protocol or under any sort of successor to it) there is no rationale for any carbon market. But the big carbon brokers and traders of the EU want the carbon market, the continuation of the CDM and even the creation of new ‘market mechanisms’. 3) The hold of global finance and banking over climate negotiations is strong. The World Bank and the Global Climate Fund mean that any climate fund linked to a post-Kyoto deal will be managed by an anti-democratic entity that is responsible for much of the climate disruption and poverty in the world. The World Bank together with support from the European Union will block any attempt at participatory governance of such a fund. This means the Global Climate Fund will be set up to funnel more profits – under the guise of mitigation and adaptation – to the private sector. 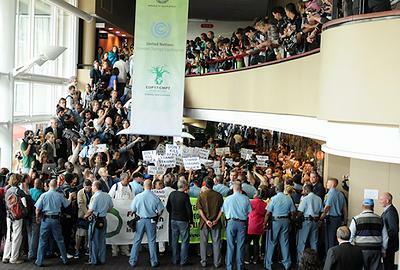 But – COP17 saw no turning point, although India’s government and its media supporters are saying so at home. Developing countries have won no victories and the poor in those developing countries must bear the brunt of the environmental impacts of business as usual. There was no agreement to urgent action – in fact exactly the opposite. India has no proposal on equity – it has none at home and therefore none to offer any climate negotiations. There is no move ahead except for finance, carbon markets and tech transfer brokers. That’s that, as I see it. Here is some material worth consulting to learn more about the ideas of equity and justice under the subject of climate change. Several more points on subjects that have much to do with climate change. On technology – “The technology discussions have been hijacked by industrialised countries speaking on behalf of their transnational corporations”, said Silvia Ribeiro from the international organisation ETC Group. Critique of monopoly patents on technologies and the environmental, social and cultural evaluation of technologies have been taken out of the Durban outcome. Without addressing these fundamental concerns, the new technology mechanism will merely be a global marketing arm to increase the profit of transnational corporations by selling dangerous technologies to countries of the South, such as nanotechnology, synthetic biology or geoengineering technologies. 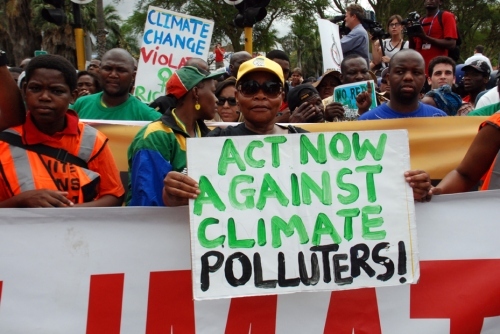 On the green economy – “We need a climate fund that provides finance for peoples of developing countries that is fully independent from undemocratic institutions like the World Bank. The bank has a long track record of financing projects that exacerbate climate disruption and poverty”, said Lidy Nacpil of Jubilee South. “The fund is being hijacked by the rich countries, setting up the World Bank as interim trustee and providing direct access to money meant for developing countries to the private sector. 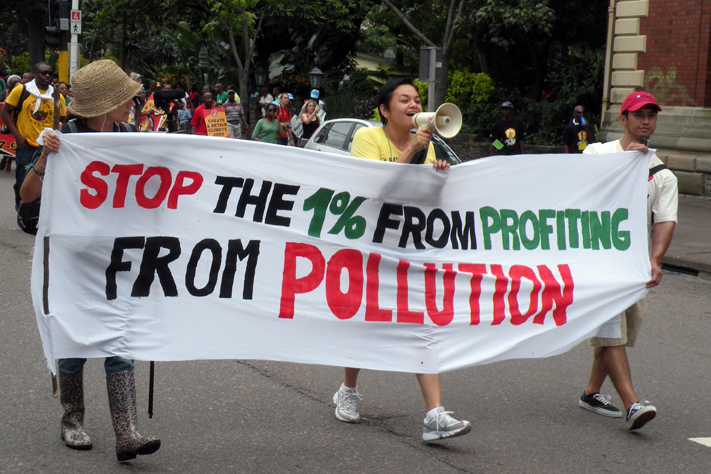 It should be called the Greedy Corporate Fund!” Climate policy is making a radical shift towards the so-called “green economy”, dangerously reducing ethical commitments and historical responsibility to an economic calculation on cost-effectiveness, trade and investment opportunities. Mitigation and adaption should not be treated as a business nor have its financing conditioned by private sector and profit-oriented logic. Life is not for sale. On climate debt – “Industrialised Northern countries are morally and legally obligated to repay their climate debt”, said Janet Redman, co-director of the Sustainable Energy and Economy Network at the Institute for Policy Studies. “Developed countries grew rich at the expense of the planet and the future all people by exploiting cheap coal and oil. They must pay for the resulting loss and damages, dramatically reduce emissions now, and financially support developing countries to shift to clean energy pathways.” Developed countries, in assuming their historical responsibility, must honour their climate debt in all its dimensions as the basis for a just, effective and scientific solution. The focus must not be only on financial compensation, but also on restorative justice, understood as the restitution of integrity to our Mother Earth and all its beings. We call on developed countries to commit themselves to action. Only this could perhaps rebuild the trust that has been broken and enable the process to move forward. "The audience comprises investment banks, corporate and oligopolistic investors, and major compliance buyers all of whom will focus on how they can profit today from an increasingly diverse range of carbon-related investment opportunities which are being designed to enter the markets from 2010"
The numbers being prepared for discussion in København are staggering by any measure, at least to those who struggle to find money for social programmes, city infrastructure needs and social sector essentials like health and education. For those accustomed to constructing enormous virtual edifices of dizzying interlinks, this is finance redux with a new set of fundamentals that are defined by the science of climate change and by the growing list of acceptable technologies used to provide adaptation and mitigation methods. 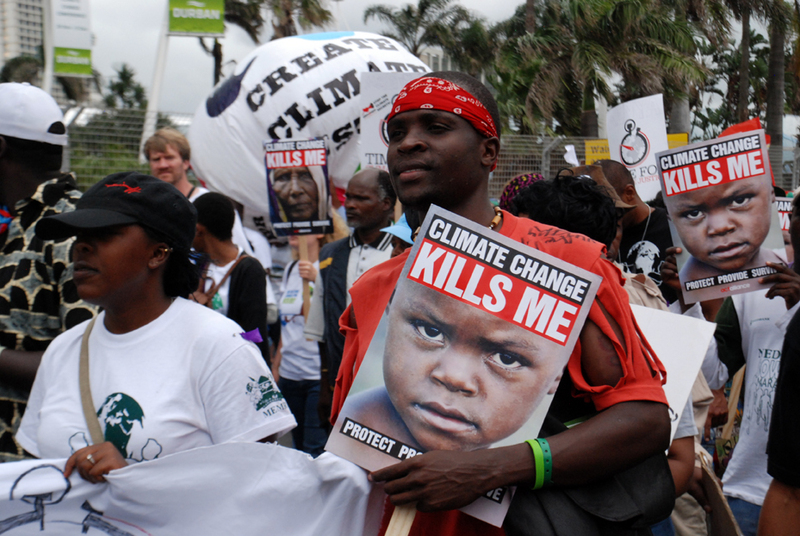 The point here, after half a decade of carbon trading and emissions and climate exchanges, is whether in fact the principles of sustainable development, social justice, equity to all – and especially – respect to and protection for the poorest and most vulnerable has been helped by the CDM and its constellation of allied activities. The short answer is ‘no’, and because that is the short answer, the future of any successor system – many will be unveiled at the København summit – is equally bleak in the terms that genuinely concern us. The evidence of failure on a global scale is in fact all around us.